If you’re using a Microsoft address [ @hotmail.com, @msn.com, @outlook.com, @live.ca, @live.com ] and you’re checking your mail on the web Outlook.com, then you know what we mean by “Focused Inbox”. Outlook.com automatically puts important mail (based mostly on your contact list) in your “Focused Inbox”. We hate the Focused Inbox. If you agree with us, then you’ll love this tip. If you like the Focused Inbox, you won’t. Step 1. With Outlook.com open in your browser, click on the Settings icon (it looks like a gear… see below). Step 2. Click on “Display settings” (see above). Step 3. In Display Settings click on “Focused Inbox” — see the screenshot below. Step 4. Tick the circle next to “Don’t sort messages” (above). Step 5. Don’t forget to click “OK” to save your changes. Most of what is coming up in my focused inbox is not email from my contacts. Mostly it’s junk mail. 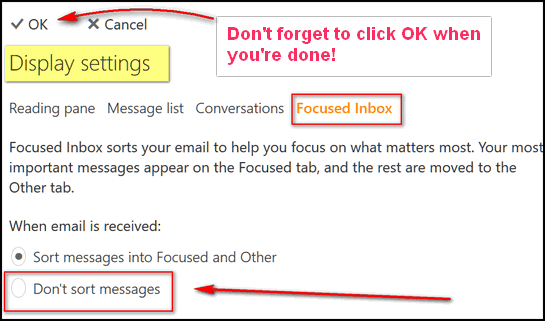 Thank you for the tip how to get rid of focus in outlook.com. I hated it. It worked. This is news to me. I’ve used outlook.com for years, and never had a ‘focused inbox’, and I’m glad. Nice to know though. Thanks. That’s exactly the first thing I did after those idiots introduced that Focused/Other-system! But now I am unable to log out of my 19 msn-accounts normally. The account simply freezes after clicking “Sign out”!? And after clicking the X the same account opens over and over again automatically when I try to log into another account!? So, the only 2 ways I know to sign into another account is after Control+shift+delete and clearing the last hour of history or a full restart/reboot, which is extremely time consuming and de facto unworkable. Hi John. I’m not sure your problem is related to “Focused inbox”. Try logging in using your browser’s private browsing mode (Chrome Incognito) and see what happens. I use Firefox and there it’s called “New Private Window”. It is still not possible to sign out of the e-mail accounts however, the accounts still freeze so I click them away via X. BUT: after clicking “sign in hotmail” in a New Private Window, I am able to sign in all my accounts with no problem (the accounts load a little slower), instead of automatically signing into the earlier frozen account. I just don’t understand how the problem of not being able to sign out anymore in the normal browser window could occur suddenly . But thanks again and keep up the good work! Look how many people, struggling with exactly the same problem, pray in vain to their irreverent absentee landlord! If any car dealer – or, for that sake, any other non-software related company – would behave that way, they would have been filing for bankruptcy a long time ago. Perhaps the fact that only the software industry – as do suppliers of certain illegal substances – is referring to their customers as “users” has something to do with it? Appreciate your comments, but reminding you that if you’re unhappy with Microsoft products, you have other choices. You have a choice of operating systems. You have a choice of email providers. Although popular, I don’t see the point in bad mouthing Microsoft. If you don’t like Windows, Outlook, or other Microsoft products, you can choose Apple, Android/Chrome or Linux. Linux offers many OS distributions free of Charge. You can use Gmail, or Yahoo mail or any of the other web mail service providers. No one is forcing you to use Outlook or Windows. Super, Thank you so much. I hated the focus thing. Gods blessings to both of you.